Pretty much the biggest news story in my feeds that broke late Tuesday is the story of a tiny coffin containing the corpse of a disturbingly well preserved three-year-old girl that was found underneath the garage of a home at the foot of Lone Mountain. As the Chronicle reports, it's believed to have been there, in the ground, for between 125 and 150 years, left behind when the former Odd Fellows Cemetery in that vicinity was shut down and the bodies all relocated to Colma around 1930. And if that is not Poltergeist-y enough, the coffin actually has glass in the top, and you can see the girl in there, skin still intact, clutching a rose, with lavender flowers woven in her hair. Just to back up, this part of the Inner Richmond, on both sides of Geary between Masonic and First Avenue, was home to four cemeteries in the late 19th Century, active from about 1860 to 1890. 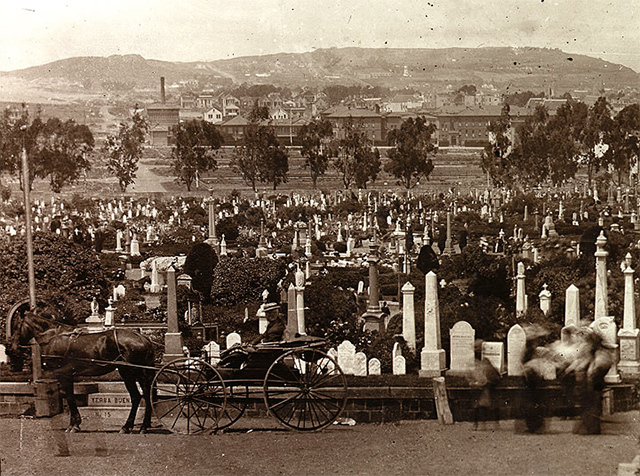 As Found SF explains, people in the neighborhood, starting with the editor of a neighborhood paper in 1894, started calling for the city to relocate all these graves to the growing burial center of Colma, outside the city. The Board of Supervisors would finally decide to do just this, perhaps pressured by real estate interests, in 1914. See the map below, with the Odd Fellows Cemetery over to the left, and the Masonic Cemetery on the present day site of the main campus of USF. 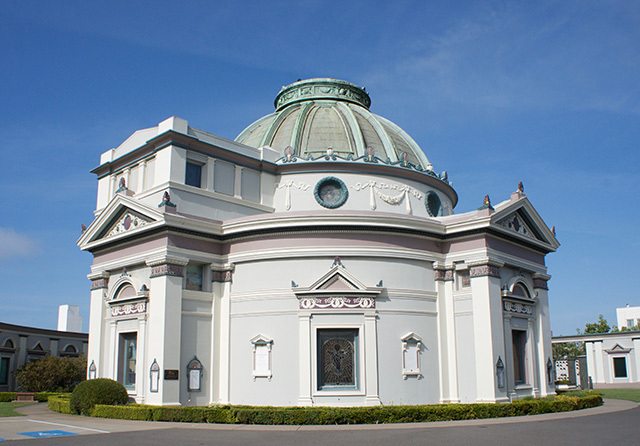 The Odd Fellows and Masonic graves were all removed and relocated to a common burial plot in Colma in the 1930's, and the only real evidence remaining of this time  besides the occasional coffin being discovered, that is  is the former Odd Fellows Columbarium, now the Neptune Society Columbarium, which was left standing for its architectural significance. It now sits, very grandly, at the end of a cul de sac just one block off Geary. 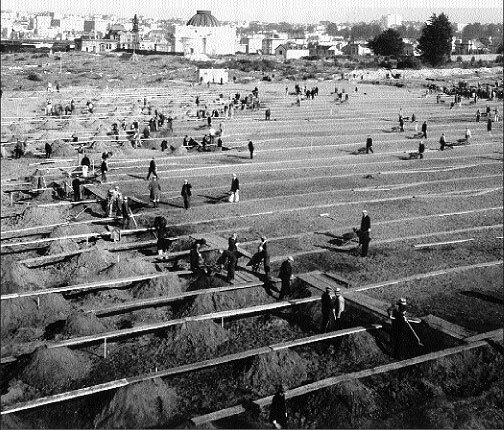 Clearing Odd Fellows Cemetery in 1933 to build Rossi Playground. The Columbarium can be seen in the background. Presumably, the bodies removed from Odd Fellows' and Masonic cemeteries were exhumed in an orderly manner, but because these two cemeteries were removed in the 1930s, several years before bodies were removed from the larger and more prestigious Laurel Hill and Calvary cemeteries, the regulations governing their disassembly were not as comprehensive as they were for the latter two, and almost no details of their removal conditions exist. So, clearly, mistakes were made. Karner had some trouble figuring out what to do with the coffin, and she was quoted a price of $7,000 by one Colma undertaker to reinter the body there. Ultimately, both the Odd Fellows  a fraternal organization dating to early eighteenth century London that still exists, FYI  and an organization called The Garden of Innocence that helps bury unidentified children, stepped in with financial and logistical help. Burial arrangements are being made, and Elissa Davey of the Garden of Innocence arranged to have the coffin picked up and brought to a refrigerator at a mortuary in Fresno  after breaking the glass on the coffin, they feared what would happen after it had been so meticulously sealed 150 years back. More upsettlingly, Davey had this to add, in the Chron piece. If anybody living around the foot of Lone Mountain to the west finds any chairs stacked in their kitchen like this, please just burn your house down.